Living “in the private” can be challenging, because regardless of your efforts to assert your living “standing”, the artificial legal “person” NAME will continue to receive demands for “payment”, or “presentments”, until the perpetrators tire of the game. As a result, you may find that you are living in a near constant state of stress and dispute, wasting much of your time and energy. All presentments to the artificial legal “person” NAME are offers of contract. Presentments from incorporated governments/corporations are addressed to the artificial legal “person” NAME, so they NEED a living man or woman to step into that “role” to take responsibility for the liabilities attached to the NAME. Presentments from incorporated governments/corporations NEED a man or woman to CONSENT to “act” in “joinder” to an artificial legal “person” NAME, forming a CONTRACT. When you REQUIRE the CLAIMANT to VERIFY their claim, a false claim will be exposed if there is no contract signed by both parties; if no man or woman can step forward as the claimant; if there is no invoice/bill signed by that man/woman; and if there is no evidence of a loss in the accounting. “Who is the claimant?” “Who is the injured party?” “We will happily settle the account when the claimant steps forward to sign the bill.” Pirates on the sea of commerce hide within corporate vessels to avoid liability, so always “require” the claimant to come forward. 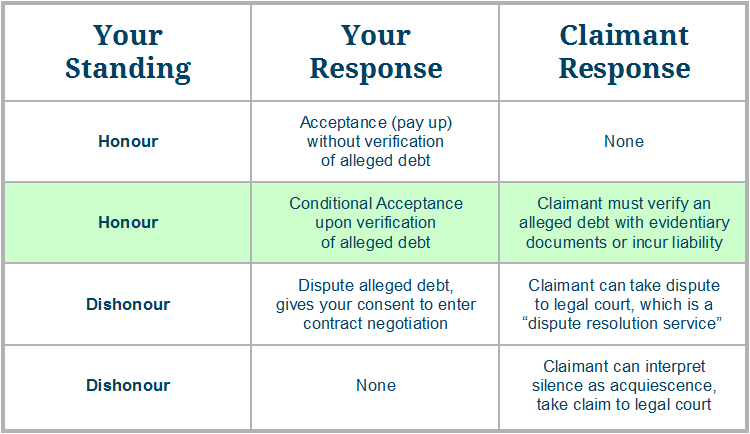 Alleged claims can be responded to with notices of “conditional acceptance”, which simply accept the claim upon verification, failing which the claimant incurs liability. This is a lawful process. 1/ Immediately give notice that you will pay any debt/remedy any harm to a wo/man upon verification of that debt/harm within x days. 2/ If there is no verified claim from a wo/man within x days, you make a claim against the wo/man who brought the false claim. Do NOT use legalese (motion, plaintiff, defendant, dismiss, plea, guilty, not guilty, etc. ), because that transfers you into their jurisdiction.